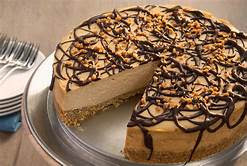 That frosting became the inspiration for today’s dessert: Skinny Peanut Butter Cheesecake! It’s sweet and creamy with a light peanut butter taste, and boy oh boy… This is the stuff dreams are made of! Mix crust ingredients together and press into 9” springform pan. Turn heat on low. Stir constantly until gelatin dissolves. In a small mixing bowl, whip the cream with the powdered sweetener. Once it’s thickened, add gelatin while beating slowly. Pour filling over crust and smooth with rubber spatula. Run knife along edge of cheesecake in pan to loosen, then remove springform side. Melt butter and chocolate in a small saucepan or microwave and stir.